All upcoming 5th-6th graders are invited to Church Project for a night of fun!! We'll have pizza, drinks, cotton candy, music, and some crazy games! 5th-6th graders are encouraged to INVITE. THEIR. FRIENDS. PARENTS, PLEASE BE SURE TO CHECK-IN, AND CHECK-OUT, YOUR 5TH-6TH GRADER ON THE DAY OF THE EVENT. WE WILL HAVE A CHECK-IN TABLE SET UP IN THE FOYER. 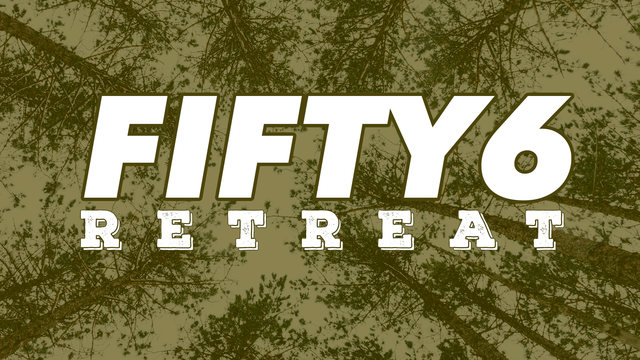 5th-6th graders are invited to RETREAT at Forest Glen. This will be a meaningful weekend for 5th-6th graders to get away from their normal routines in order to focus on their relationships with Jesus, have fun, and be together. Join us for an amazing week in the woods at Forest Glen! Kids that have completed 1st-6th grade (2016-2017 school year) will make lifelong memories, enjoy the great outdoors & grow deeper in their walk with Christ at kidCAMP 2017! Registration will CLOSE on Tuesday, April 18 at noon! All 5th-6th graders are invited to take some time out of their spring break in order to serve others. Why? Because that’s what Jesus did, and that’s what He wants us to do. FFITY6 will be serving in different ways throughout the week: helping to package product at Mercy House that will empower women across the world, sorting food at The Montgomery County Food Bank that will go to families in need, and creating hygiene kits with Hope Beyond Bridges that will help the homeless. Parents will drop off and pick up at Church Project each day. Cost includes transportation, lunch on Wednesday, movie ticket, unlimited pizza and drink at Incredible Pizza, $5 game card, & 1 hour of video game play. Please bring $ for lunch on Monday & Tuesday, movie snacks, and any extra games at Incredible Pizza. Hope Beyond Bridges has also requested bug spray to help with the summer hygiene packs for the homeless. 5th-6th graders are encouraged to bring 1-2 bottles of bug spray as it would be greatly appreciated! Kid night + Friday Night Frenzy is an awesome evening for kids and parents! Kids will check-in at 6:30PM at Church Project for an evening full of games, pizza, cotton candy, inflatable craziness, and MORE! While kids are having a blast, parents will have an opportunity for a date night on their own with conversational materials provided by the CP marriage ministry. 5th-6th graders are invited to come ice skating at The Woodlands Ice Rink as we celebrate Christmas! We'll have lunch together at the Ice Rink and then have some fun skating together. 5th-6th graders are encouraged to INVITE THEIR FRIENDS! Parents will drop off at the Ice Rink at 1pm and pick-up between 2:30-3pm. (YOU WILL NEED TO SIGN-IN YOUR KIDS AS WELL AS SIGN THEM OUT). 5th-6th graders are invited to Church Project for a night of crazy fun!! We'll have pizza, drinks, cotton candy, music, Zorb balls, sumo suits & obstacles! 5th-6th graders are also encourage to INVITE. THEIR. FRIENDS. FIFTY6 is going to Sk8town in order to celebrate the upcoming 6th graders as well as welcome the incoming 5th graders! Don't miss out on the opportunity to come be together before the school year begins! Bring $10 for skate rentals, we'll provide the pizza! Aug. 21 is PROMOTION SUNDAY! We're excited to celebrate our kids moving up into their next grade levels. On Sunday, Aug. 21, all 6th graders will officially promote to 7th grade and join their families in the main gatherings at CP and all upcoming 5th graders will join FIFTY6! That means that the Sunday, Aug. 14 will be the current 6th graders (upcoming 7th graders) last Sunday in FIFTY6 before joining ProjectStudents! Join us for a beautiful night for dads to love to their daughters. Moms will take part in a meaningful way and help their girls prepared for an elegant dinner and dance with dad. Childcare provided. 5th-6th graders are invited to come play Zorb sports @ Legends Sports Complex! Zorb Sports? Check out the video below! We'll have pizza, drinks, cotton candy, and some loud music...not to mention a LOT of laughs. INVITE. YOUR. FRIENDS. PARENTS, PLEASE BE SURE TO CHECK-IN, AND CHECK-OUT, YOUR 5TH-6TH GRADER ON THE DAY OF THE EVENT. WE WILL HAVE A CHECK-IN TABLE SET UP BY THE SOCCER FIELD (DIRECTLY TO YOUR RIGHT AS YOU ENTER LEGENDS). Date night + Kid night is an awesome evening for kids and parents! Kids will check-in at 6PM at Church Project for an evening full of games, sports, snacks, pizza, candy, a bounce house, and MORE! While kids are having a blast, parents will have an opportunity for a date night on their own with conversational materials provided by the CP marriage ministry. 5th-6th graders and their friends are invited to come have some lunch together at Which-Wich and then see Kung-Fu-Panda 3! Parents will drop off at Which-Wich, located across the street from Tinsletwon movie theater (by the The Woodlands Mall) and then pick-up in front of the movie theatre. 5th-6th graders are encouraged to INVITE THEIR FRIENDS! 1PM: Parent drop off at Which-Wich. (please be sure to accompany your child to check-in). There will be volunteers located just outside Which-Wich. 4:30PM: Parent Pick up in front of Tinsletown theatre. $5 registration (includes discounted movie ticket, only available to those who register by 5pm on Thursday, Jan. 28 ). Please note that we will be seeing the 2:20PM showing of Kung-Fu-Panda 3, which is a 3D showing. Any registrations received after Thursday at 1pm will be responsible for purchasing full priced ticket at the Theatre. Parents will drop off at the Ice Rink at 1pm and pick-up between 2:30-3pm. Parents, YOU WILL NEED TO SIGN-IN YOUR KIDS AS WELL AS SIGN THEM OUT. The Ice Rink is located at the northeast corner of Six Pines & Lake Robbins Drive. Parking is available surrounding the Ice Rink.